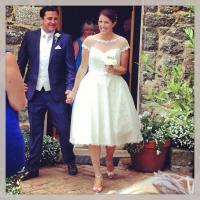 "Michele, Thank you so much for helping me get the dress that was in my head. Not just an 'off the peg one fit all' dress. Alastair and I had the magical day we were hoping for! when I walked in all i heard were gasps - just the reaction any bride would love"
Choosing to buy her Dress from Marianne Jessica’s was one of the the best Wedding Day decisions my daughter made! 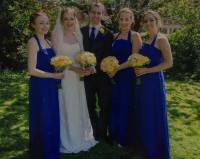 Not only was the dress beautiful, but we met with the designer who incorporated some changes so it became bespoke. But more important than that was the service we received. Although we chose the dress nearly a year ahead, my daughter started losing weight around the time of the final fitting. Michele, the proprietor, extended fitting appointments and continued to reduce the size of the dress up until a few weeks before the big day. I really felt that few other shops would have been so flexible and obliging. Also, Michele, with her great experience was able to give me some good advice to me about outfits and hat and makeup and shoes ….! "Dear Michele, Thank you so much for making me a look like the better version of myself on my wedding day. 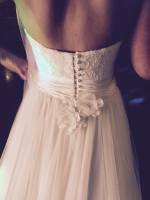 My wedding dress was absolutely exquisite - I am still getting compliment about it! It was an absolute pleasure working with you and I trusted and valued your opinion from the very beginning. Your professionalism and attention to detail was wonderful. You made me look and feel so very special and for that, I thank you!" Michele was AMAZING! I had been to 10 other bridal stores and could not find my perfect dress....I knew what I wanted but could not find that perfect dress. I walked into Marianne Jessica and Michele made me feel great, she told me whatever size shape or body type you have she will find you your perfect dress. She was right! I picked out the dresses I liked and then she also chose one for me and said honestly you will love it. The dress she chose was absolutely perfect it had my mum and my bridesmaid tearing up and when I had seen it on the hanger I had dismissed it. Michele absolutely loves what she does, she takes so much pride in seeing a bride in one of her dresses and she’s so knowledgeable about the dresses and how it will suit a person as well as accessories like the veil, shoes, tiara etc. I cannot recommend her highly enough. Please ensure you come to this shop before you make any final decisions, so glad I did not settle for any other dresses and came here and found my PERFECT DRESS. Could not be happier. 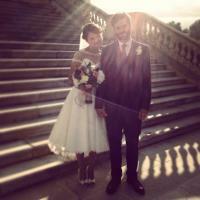 "I just wanted to drop you a very belated but huge thank you for all your time spent on my dress. I simply loved it! both you and your staff were so helpful and friendly right from the start and i'd recommend you to anyone! 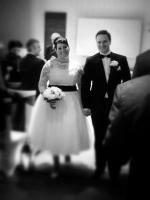 we had the most wonderful day and as you predicted the veil stayed on for the duration. 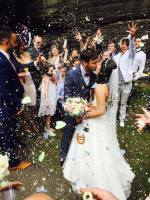 Thank you so much again"
"Dear everyone at Marianne Jessica, Thank you ever so much for making our day so special. I felt beautiful!" 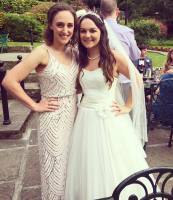 "Thank you so much for my amazing wedding dress! Thank you for all the changes you made to it with the halter neck and the buttons down the back, it was stunning and absolutly perfect. 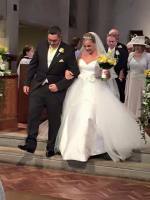 Thank you also for encouraging me that its ok to have some sparkle on your wedding day." "I had tried a number of other shops but no one had really understood what I wanted or spent time just trying to get me to buy their most expensive dress. Michelle at Marianne jessica was a revelation. There is an amazing set of dresses to choose from, in addition to them offering to order in any others you might want to try on. 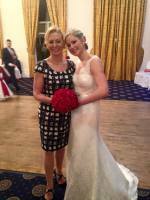 The individual and first class service made choosing, buying and fitting my wedding dress a great experience. I cannot recommend them enough to anyone looking for a wedding dress. Its just a shame you only get to go there once!" "Thank you Michele and Team! It was fate that I found your shop. After a disaster at the outlet round the corner we googled shops near by and a you popped up. After a friendly person answered confirming it would be fine for me to pop in because it was a designer day for Chanticleer we were there in minutes. With help from all that day, a cupcake and glass of bubbles, we created my own unique dress by putting two dresses together. That in itself made the experience perfect! A few months later I came to see the final product, it was love at first sight. I was counting the days down until I could take it home! Every time I visited the shop I always felt very special, usually had the shop to myself which was lovely. Michele was great at advising me on everything from veils to jewellery. Lovely ladies, I would highly recommend"
Hi Michelle, I just wanted to say thank-you so so much for all your help and advice with my dress. I absolutely loved wearing it and all my guests were very complimentary too! You're wedding shop and all the dresses in it are beautiful, I only wish I could shop there again! Thanks again!